Beverly is distracted about the $1,000 she paid to Rhys's parents. Des buys some new clothes for his new job. Melissa turns up at the Robinson house while Cody is there. They realise Todd has been two-timing them. Todd stutters that Cody has just dropped around to say hello, but Cody tells Todd to be honest. Todd reckons going out with Cody doesn't count(!) but Melissa is upset and storms out. Cody realises that Todd still loves Melissa. She calls him a user and storms out. Hilary is putting some cream on Sharon's sunburn but she's still insisting that it's healthy(!) Sharon still hasn't found a job, but this isn't surprising considering she only wants to work at the beach! They chat about Lee and Nick spending time together and wonder what will happen when Matt gets home. Lee comes in and invites Sharon to come down the video parlour with her and Nick. Sharon invites Lee to the beach tomorrow, but she's too busy at the Coffee Shop. Beverly is putting Rhys down to sleep when Todd comes in shouting about Melissa. Beverly and Nick shush him. Todd claims it wasn't his fault because Cody kept asking him out(!) Beverly says Todd hasn't been fair to either Cody or Melissa - he should ring them both and apologise. The doorbell rings and it's Des - he's dropping off the accounts. Beverly apologises for snapping at him before and assures him that the $1,000 was a one-off. 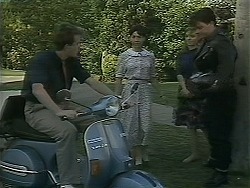 Nick is walking along with Lee when Matt arrives home - on a scooter. Lee gives him a pash. Cody has come round to see Todd. Todd apologises for what happened yesterday - he should have told Melissa. Cody says she'll have Todd back, but he doesn't want her - he wants Melissa. Cody tells him off for lying and stalks off. Nick didn't get the job, so is hanging out with Lee. Matt comes in and tries to get Lee to go to the beach. Nick joins in with the persuasion and Lee eventually agrees. Matt looks suspiciously at Nick. Melanie is exercising and accidentally hits Des on the back when he comes in. Des didn't have a very good day at work - he was made to play squash with his boss after work. Now he's knackered and also, he hit his head on the changing room floor where he fell over. Melanie suggests practising with Paul. Todd is brooding at the living room table. He tries to ring Melissa, but just then she turns up in person. It seems she's decided to give him a chance to explain. Todd says he was lonely when Melissa was away and started hanging out with Cody for company, but Melissa is his real girlfriend. Melissa has decidedt to forgive him, saying everyone makes mistakes sometimes. Nick and Lee are hanging out until Matt gets exasperated and takes Lee off for a walk. 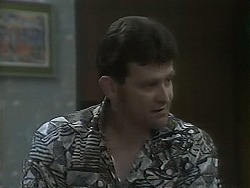 He asks Lee if there's something between her and Nick, but Lee says Nick is just a mate. Matt gets mad - they were talking about getting a place together before they went away and now she's hanging out with Nick. Lee gets fed up and goes home. Des is worried about the squash thing and also his boss's other passion - abseiling! Nick is assuring Matt that there's nothing between him and Lee and Sharon apologises for stirring. Sharon gets up but doesn't look very well. Then she faints back on to the sand. Beverly comes into the shop to find Deborah and her horrible boyfriend there. He tells her that they're broke again - $1,000 doesn't go very far these days. He tells Beverly she's going to have to give them more money if she wants to keep Rhys.